The requirements placed on visual surface quality are especially demanding for architectural concrete. Of great significance here, moreover, is not only consistent quality assurance for all components – i.e., uniform surface quality and color – but also implementation of preventive measures to ensure that undesirable external ageing effects are prevented altogether. 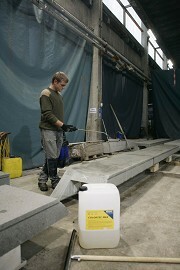 Giving concrete a look of natural stone is today of special importance. Particularly in the design of curtain façades, architects aim to create a natural stone look. To obtain these results, the use of the required construction chemicals is in great demand. Here, the preparation and conservation of the surface are two separate processes that have only indirectly aspects in common: i.e., in that both processes are usually carried out by the same specialist tradesman in subsequent steps in the same place: the wash station. Concrete is strongly alkaline. Accordingly, its surface can be attacked with acids. They destroy the upper cement layers, causing fine aggregates such as individual sand grains to lose their hold. They are washed out in such a way that the initially smooth surface becomes rough and takes on a matte color. The surfaces of a completed precast component can therefore be processed after production down to a penetration depth of max. 0.5 mm. Even rougher surfaces are possible, and finishes of this kind are called exposed aggregate finish. 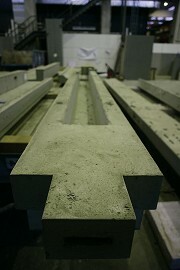 These surface finishes are obtained using special acid formulas which, however, are applied (instead of form oil) to the interior surfaces of the concrete formwork prior to casting. They prevent the still liquid concrete from forming a surface network: i.e., the regular setting process near the surface, and allow complete outwashing of the unbound particles immediately following removal of the form. Acid treatment usually takes place in the plant on the same day as casting, on the freshly hardened concrete. The construction chemicals manufacturer Hebau specifically developed the product Microgel as an acidic agent of gel-like consistency. The viscous mass tremendously simplifies handling, allowing among other things uniform application of the substance on three-dimensionally formed objects, or on vertical surfaces, without streaks running downward. This is of special significance for wall elements and/or large-area components that, following demolding, are brought into a vertical position for further processing. This applies both to elements manufactured on tilting tables and on pallet rotation systems, because in each case they are picked up by a crane hook on which they are usually suspended in vertical position. A thin fluid would be difficult to apply uniformly and would require time-consuming handling – which always entails a higher damage risk. It is, in fact, also possible to spray on the acid-wash chemical like varnish. For this purpose Hebau makes the basic chemical Microgel available with a low-viscosity variety available, as well as acid-resistant spray units. According to Marcus Herrfeld of Hebau, spraying on the acid has all the advantages for large-area elements and not as many especially for markedly three-dimensional objects. The effort involved is comparable: the worker must position himself in relative close proximity to the object and apply the acid to the individual contours; no matter whether he uses a sponge, a squeegee, or a hand-held spray pistol. The reaction takes place immediately after the chemical is applied. The acidic agent is left on for about 15 minutes to act. Subsequently, it is simply hosed off with fresh water. The use of high-pressure equipment is not required for this purpose, although the application of some pressure is certainly conducive to cleaning. For varying the penetration, i.e. to obtain surfaces of various degrees of roughness and/or matte surfaces, the acid wash is applied in varying concentration – or the procedure is repeated, up to three times. Watching a worker clad in acid-resistant safety garb and wearing a filter mask apply the initially colorless acid-wash gel with a broadbush on a long handle to the concrete components looks, admittedly, rather unhealthy. The reaction starts immediately, visible as wild foaming and may even discolor the acidic gel to viscous, blazing green film. The resulting chemical mix is, once the reaction is complete, nearly pH-neutral. It is subsequently rinsed off the concrete component with fresh water, largely diluting in the process the acidic residues. The resulting wastewater is always collected and drained into a settling basin, the same as the entire wastewater from precast production. The settling basin, as the name suggests, has the purpose of enabling all the suspended matter that is washed off throughout the plant, even smaller stones, to settle – and not to clog the public sewer in the course of time. Owing to its cementitious origin, the milieu of this suspended matter is always alkaline, so that the last remainders of the acid-wash gel are ultimately neutralized. Of special importance in this connection was the assurance by Marcus Herrfeld that the products from Hebau contain no heavy metals or nitrites. Hydrophobation was long regarded in concrete practice as the best method for obtaining long-term weathering protection for concrete surfaces. The quality obtained by that method is to this day without doubt. Problematic is, however, the long time this requires. According to the textbook, the complete precast concrete elements must be totally hardened prior to the treatment, i.e. for at least 21 day and should be as dry as possible. For this, the elements would have to be stored for this period of time protected from the weather. There is hardly a precast plant where such storage area is available and that could afford such protracted production times in these fast-living times. With its product Colortec, Hebau, the manufacturer of construction chemicals, offers an effective alternative to this method. Instead of hydrophobing an element in a dry state, it can be impregnated virtually immediately following acid treatment when the moisture content is still as high as 70%. The decisive key property of Colortex is its breathability, since especially “young” concrete may not be sealed watertight, but must still be able to continue to dry out. Herrfeld says also that Hebau has learned from history and did not want to make the same serious errors of the early beginnings of water-repellant concrete sealing some forty years ago. The initial approach in the early 1970s, now known to be totally wrong, was to apply a watertight barrier across the entire surface of a building component. This coating, however, was never as perfectly tight as desired: there were always some hairline cracks through which water could penetrate. Not to forget the inherent moisture content. Both together led to surface-near waterlogging ultimately resulting in unsightly frost scaling. Herrfeld does not reveal the exact composition of the chemical, fearing copycats. Only this much: the principle functions neither on purely mineral basis, such as the use of Siloxan, nor on a purely organic basis, such as acrylate. The quantity required for impregnation fluctuates considerably and depends on the surface characteristics. An untreated smooth surface of a self-compacting concrete requires a much smaller amount than a surface with a roughness depth of 0.5 mm that has undergone a strong acid treatment. In the latter case, one can assume a requirement of roughly 200 ml/m² impregnating liquid. For impregnating a paving block of low density and consequently a higher absorption capacity, a higher consumption rate must be expected. The degree of saturation of a surface of that kind is approx. 250 ml/m². The impregnation process itself, considering the immense impact it has on the quality, is rather prosaic: The chemical is sprayed on as aerosol using a typical pump spray container as used on a construction site, the same as used for spraying on form oil. Left on for a minute to soak in. Finished. On the hook. Even if impregnation is a relatively unspectacular and quick procedure, at Hebau a service life of at least ten years is assumed for this breathable sealing. The susceptibility of a component to weathering resulting from the installation site, of course, significantly influences its service life. An element installed on the weather side, for example, will age considerably faster than one installed in a protected corner. Precast elements arranged in horizontal position, such as paving blocks, are also not be able to resist the effects of weathering as well as vertical walls. All in all no prediction on the durability of surfaces can be made worldwide. Herrfeld might possibly be able to make such as prediction for a region of the size of Germany, but an estimation alone for all of the EU is difficult. The closer one approaches the permafrost regions of the geographical poles, the colder and frostier it naturally gets and the warmer, of course, the closer one gets to the equator, where the UV radiation is, moreover, incomparably higher, due to the rising number of sunshine hours. Although Colortec is totally UV stable, the proneness of a building component to the effects of increasing UV radiation hastens weathering. Since the development some forty to fifty years ago of precast façade elements that can be produced in series, in good quality, and in large quantities, the perception of this construction material has undergone a remarkable change. In the 1970s precast concrete was still regarded as a cheap mass-produced building material: used, for example, for building up the entire former Eastern European countries with standardized slab blocks, and sadly lacking in detail. It is now experiencing something of a renaissance and, making an impression somewhat like natural stone, it is now regarded as an elegant solution. With its massive dimensions and durable impression, it represents a pleasant contrast – particularly in façade constructions – to the slender playfulness and glassy randomness so popular in administrative buildings. It now firmly established with a high recognition factor – and with landmark qualities. Investors have also come to recognize the creation of durable values and increasingly promote precast concrete. Concrete has come to be regarded as a construction material with a long service life. This advantage, however, must also be rendered recognizable and care should be taken that it is noticeable over the long term. A number of construction chemicals appear in fact to have advanced this claim appreciably.